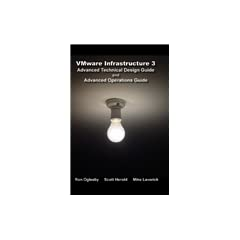 VMware Infrastructure 3: Advanced Technical Design Guide and Advanced Operations Guide by Scott Herold, Ron Oglesby (formerly of GlassHouse, now with Dell, and bench presser of Lord knows how many pounds), and Mike Laverick. ISBN: 978-0971151086. Ok, the truth is I’ve had the pre-release Author’s Edition of this book since February of 2008 and I had read a few chapters, but I haven’t read the final copy cover to cover like a book of this calibre warrants. I picked up the final copy in September 2008 just before VMworld 2008. If the author names sound familiar to you, well, they should. Oglesby and Herold wrote the earlier version of this book a few years ago and it was dynamite! Laverick joins the duo as a VMware Infrastructure expert, VMware instructor, proprietor of RTFM Eduction, plus extensive Citrix experience (the man has paid his dues). Lately, Laverick has been on a VMware Site Recovery Manager kick. If you’re getting into SRM, definitely check out Mike’s site where you’ll find valuable information plus the first and only book I’m aware of dedicated to SRM. Expectations: Advanced concepts. Tips and tricks I won’t find in VMware documentation. Real world scenarios from the datacenter and classroom. At just over 800 pages, I would have been able to devour this in a week or less in my younger days. With a busy family and work life, I expect I’ll be chipping away at this book for a good month or more. But it’s not a race. What’s important is understanding and retention of the concepts. I’m thinking about the VMware Certified Design Expert (VCDX) certification soon and hopefully this book will help in those studies. VMware ESX Server training by Trainsignal. Iman Jalali (Director of Sales and Support, Trainsignal) contacted me via Twitter and asked if I’d like to review a copy of Trainsignal’s latest VMware ESX video training. Are you kidding me? Just about anything VMware related I can get my hands on is a good thing. Jalali did not ask for a blog review or even a mention, however, I appreciate his generosity as well as the generosity of Scott Skinger (Founder/President of Trainsignal) who comped me Microsoft Exchange Server 2003 video training back in 2007. David Davis (from this and this, among other things) is the instructor of this 18+ hour 2-DVD series. I’ve known (of) David for a few years from my participation at the Petri IT Knowledgebase. David has a lot of positive energy and his certifications include CCIE (I’m not worthy sharing the same Oxygen as he) and VCP. I very much look forward to watching this series. One thing though guys (and this goes out to all the VMware book authors too): With the virtualization landscape evolving so quickly, the versions and configuration maximums being rasied by VMware almost quarterly, I wish you the best of luck keeping your material current! That has to be a big challenge and somewhat of a frustration at the same time. It is now time for my Pre-New-Years cheesecake. As if I needed an excuse for cheesecake. Happy Holidays! I thought tonight was the night I was going to post some “Citrix XenApp virtualized on VMware ESX” that many have been asking me for behind the scenes, but alas it’s 10:30pm and I just don’t have the energy for such a post that will require considerable effort to put together. I’ve accumulated some information here and there for various people, but it’s time to formally consolidate the scattered pieces of information into one decent post that I can fine tune as needed going forward. Before you start licking your chops in anticipation of a rocket science blog post on virtualizing Citrix, please don’t. What I promise is the details and discoveries behind one person’s virtualized Citrix environment. With VI3, virtualizing Citrix is fairly straightforward but extra special attention must be paid in determining virtualization candidacy. Now I wouldn’t want anyone to walk away empty handed from my blog on Christmas so I leave you with this: A no-frills post revealing the source of where I get 90-95% of my daily virtualization information – RSS feeds of various blogs and websites. This file (right click, save as – it’s XML) contains an export of all of my RSS subscriptions. Import it into your favorite RSS reader. Set your RSS subscription refresh interval to 15 minutes. Stay informed with nearly up to the minute and late breaking VMware virtualization news. With new blogs and sites popping up weekly, for sure this list is nowhere near what I would call complete. If you have any suggestions or if you see a great blog or site that I am missing, by all means, let me know in the comment section below. I’m the type of guy that can never get enough VMware virtualization information. Disclaimer: My RSS subscription list contains a few subscriptions to non-virtualization related feeds which you may want to remove. Update: I’ve added two more great blogs to the RSS feeds: Gabe’s Virtual World (Gabrie van Zanten) and Jase’s Place (Jason McCarty). Veeam has come through with their greatly anticipated free tool that had been receiving festive holiday hype leading up to this morning’s release. The download queues are jammed at the moment but the tool can be grabbed from this link. I’m preoccupied with babysitting (for the next two weeks actually) and unfortunately I don’t have the resources to go into details about this release. For that, I’d like to refer you to a few blogs that have alread done a good job of this, in chronological order of how they showed up in my RSS reader: Rynardt Spies, Mike Laverick, David Marshall, Scott Lowe, and Rich Brambley. Enjoy this present and be sure to send a warm “Thank You” to the people at Veeam such as Doug Hazelman, Carrie Reber, and the rest of the talented staff. PS. I had announced this tool at the Minneapolis VMUG last Friday. Up until this point, I had always been pronouncing the company name as VEEM (with a long E). Someone at the VMUG corrected me saying that the company name is pronounced “VEE’-am” (like two words with the stress on the long E and a short A afterwards). Rich Brambley of VM /ETC allowed me to take a look at the Veeam present located under his tree. Due to our carelessness, more wrapping paper seems to have been worn away! Can anyone guess what this tool might be? I’ve got a hunch and my guess can be found in the form of a tag below this blog entry. Be sure to register for free copy of this tool being made available by Veeam on December 22nd! Have you seen TechTarget’s IT Knowledge Exchange? If you are an IT staff member in search of answers or excellent technical blogs, ITKE is one site you’ll want to bookmark. Their award winning editorial staff include virtualization bloggers such as Eric Siebert, David Davis, prolific VirtualCenter plugin writer Andrew Kutz, Rick Vanover, Edward Haletky, and many more. Search or browse by hundreds of tags covering hot IT topics such as Database, Exchange, Lotus Domino, Microsoft Windows, Security, Virtualization, etc. Their value proposition is simple: provide IT professionals and executives with the information they need to perform their jobs—from developing strategy, to making cost-effective IT purchase decisions and managing their organizations’ IT projects. One month ago, brianmadden.com was purchased by TechTarget. I think this addition will be a nice shot in the arm for ITKE. In one transaction they integrate an established rich Citrix/Terminal Services/Virtualization knowledgebase and talented staff of bloggers that it can in turn use to help its readers and advertising clientele. TechTarget has over 600 employees, was founded in 1999, and went public in May 2007 via a $100M IPO.